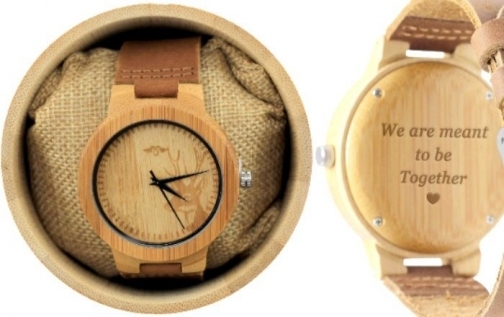 This handcrafted Bamboo Men's Watch by Angie Wood Creations is as unique as it is stylish, offering a retro-inspired wooden watch to suit earth-conscious shoppers. Fashioned from high-quality bamboo, this men's analog watch is built for accurate timekeeping and affordability. Complete with an original deer-etched bamboo dial and leather band, we believe this is one design you will truly appreciate. Featuring hand-etched bar markers, black hands and a black dial ring, this watch merges nature with technology. Its simplistic beauty and elegance is at the heart of this wonderful watch, creating a timepiece that you will truly treasure. 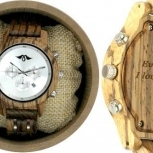 ENGRAVED BAMBOO: Express yourself with this quality, handmade wooden fashion watch by Angie Wood Creations. 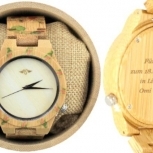 Durable and lightweight, this deer-engraved bamboo watch will resonate with those who have eco-fashion sensibilities. The perfect watch to wear on all occasions, whether on holidays or relaxing at home. GENUINE LEATHER BAND: The caramel-coloured genuine leather band offers a contemporary edge to this retro design. Original and full of character, this men's watch will keep accurate time all day and all night. 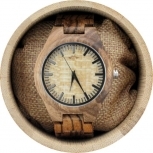 When selecting a gift-worthy wooden watch, quality is one of the most important factors; you can't go wrong with a unique timepiece from Angie Wood Creations. 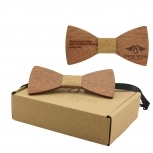 COMFORTABLE FASHION: Comfort and enjoyment are high on our priority list when it comes to creating fashionable men's wooden watches. 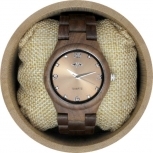 This bamboo watch with complementary adjustable leather band ensures complete satisfaction and peace of mind. 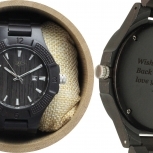 Made from the finest materials on the market, this handcrafted watch offers a superb solution to men's fashion.